What is Fly Line Backing and How Much Do You Need? Picture this, you’ve hooked into an amazing fish and it’s peeling off fly line. You look down at your fly reel and ask yourself – do I have enough line? 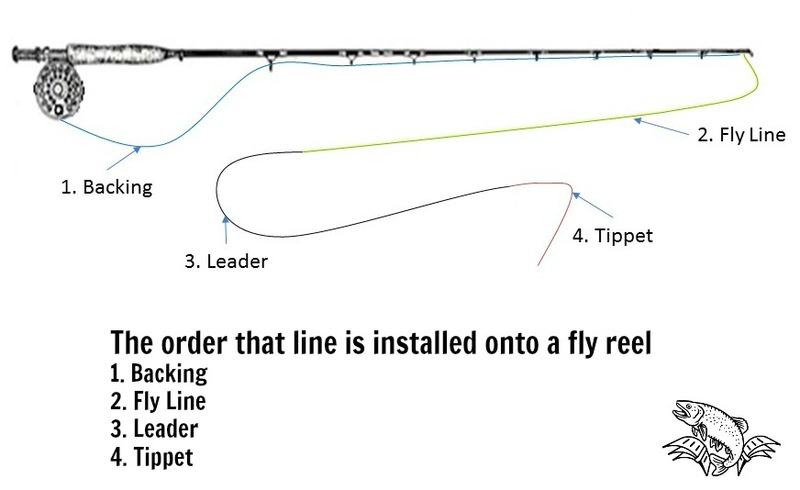 Fly line backing is a line that extends the total length of line on your fly fishing reel. Usually made from Dacron, backing is typically purchased in 12-lb to 30-lb breaking strength.? Backing spools come in lengths from 50 yards to 1000 yards. The backing line is attached to the fly reel arbor and fly line. Do you need fly line backing? It really depends on the type and size of fish you are targeting. A typical fly line is 90 to 110 feet in length. If you cast out 30 feet of line, you’ll have over 60 feet of fly line on your reel to fight a fish. If you know the only thing you’re going to hook is small brook trout or pan fish, 60 feet is probably more than enough. If your fishing for anything bigger than little fish, you want to have some backing on your reel. Call it insurance for that fish of a lifetime. In freshwater carp, steelhead and salmon commonly pull out enough line to put you into the backing? It really isn’t hard for a fish to run a hundred feet of line out, particularly when river current is involved. If you are fishing from a boat sometimes it’s difficult to stop close to the fish for safety reasons; trees, rocks and bends. This means continuing until you find a good spot is found, all the while line is being pulled from the reel. What is fly line backing made of? Dacron Backing – Dacron is a brand name for Polyethylene terephthalate (link to Wikipedia) which is a thermoplastic polymer. Abbreviated as PETE or PET used in clothing and those popular water bottles laying all over the ground. What makes PETE good for fishing line also makes it bad for the environment. PLEASE pickup any loose line you may drop. Dacron backing is woven or more correctly it stated it is braided. Gel Spun Poly Backing also called Ultrahigh molecular weight polyethylene UHMWPE (link to Wikipedia). UHMWPE is manufactured in a way that yields extremely long molecular chains. This long length is what gives it high strength. Gel Spun Poly is produced with the same class of materials as bullet proof jackets and vehicle air bags. This same strength property is what allows such small diameters for comparatively high breaking strength. Dacron is probably the most common backing. It’s a cost-effective material to extend the length of your fly line. Use Dacron when you aren’t worried about overloading your reel and the fish you?re targeting aren’t going to run more than 300 feet. 30 lb Dacron is .024″ diameter. Think of kite string as a comparison diameter. Because it’s a little bit bigger that gel-spun you’ll get less capacity on your reel. For Dacron backing I recommend the RIO Fly Line Backing (link to Amazon) You can select either 20 lbs or 30 lbs. 30 lb Gel-spun poly is usually .014″ in diameter this is thin stuff. But being so thin is what allows you to load up long lengths of line onto your reel. If I’m asked what GEL SPUN BACKING I recommend, look at the Scientific Anglers XTS Gel Spun – 30 lbs (Link to Amazon) You can buy it in different spool sizes from 100 yards to 3000 yards. Backing is the first line to be wound onto your fly reel. Next is the Fly Line, then Leader and finally the Tippet. How do you attach the backing to the fly line and fly reel? The most common knot for attaching backing to your fly fishing reel is an arbor knot. An arbor knot is a couple simple overhand knots forming a slip knot. Attaching backing to the fly line is usually done with a NAIL KNOT. A nail knot is one of those essential knots I’ve detailed in this video. How much backing should I put on my reel? The simple answer is as much as your fly reel will hold. The most important thing to remember when loading you your reel is that you shouldn’t put so much line on that the fly line will touch the reel frame. It sometimes takes a little trial and error to get the right amount but having about a 1/4 inch of clearance to the reel frame is perfect. You want to avoid the fly line touching the frame because rubbing the fly line against the metal will damage the line. Salmon – 250 yards of 30-lb Dacron backing. Your often in a current with salmon and sometimes they just keep going. Large capacity spools are a must and that thicker Dacron is easier on the hands. Tarpon and other big ocean fish – +300 yards of 30-lb Dacron backing. These fish will take you into the backing and Dacron is much easier on your hands. Most times you?ll be fighting these fish from the fly reel. But for those rare times you must touch or retrieve backing by hand Dacron is a blessing. Can I use a substitute for fly line backing? In a pinch Ive used regular monofilament a backing on a fly reel. I don’t recommend this though, monofilament seems to have a much shorter life span when compared to Dacron. I’ve also talked to folks who have used industrial sewing thread as backing. The same material as what leather bags and car seats are sewn with. This isn’t as much of an issue with the newer large arbor reels, but backing also increases the diameter of the reel before the fly line is added. This increase in diameter lessens the memory loops in the fly line and increases the rate of line retrieval when reeling in. Does the color of my backing matter? Functional I would say it doesn’t matter what backing color you select. Remember the primary reason to have backing is to add length to your fly line as an insurance. Ok – putting function aside, it does look pretty cool to have a color that compliments you reel and line.